This is most certainly the nicest looking transparent tote I have ever seen. 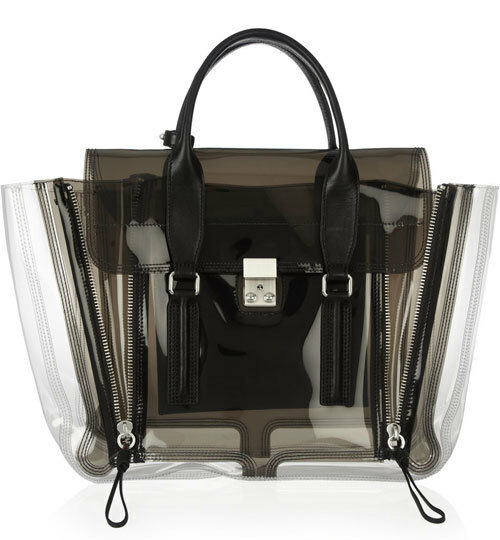 Considering how popular Philip Lim's Pashli totes are, it is the perfect transparent tote, right? The smoky colour allows it to be worn day and night and the black leather interior pouch gives you the option to hide what's inside. However, for €610, is this plastic bag worth it? If I had the money, honestly, I'd probably buy one, but as I have not got an endless cash flow (yet.. lol) the hefty price tag means I won't be purchasing it any time soon *sad face*. What are your thoughts? That bag is serious! I love it! Thanks for stopping by my blog girlie! so minimal and so cool. love it. I agree....this is an adorable transparent tote!! I think i just fell in love with that bag.... I am so glad i found your blog! Seriously it feels so fresh and i like it how it is so organized :) You found yourself a new reader! I am happy that i stumbled upon you on IFB! Really love this post and this blog! I love the bag,so cute!! Hey, I really like your blog! The bag is simply stunning. If I were still in high school and the whole "see-through" bag rule was implemented, I would so rather carry around this tote rather than a backpack.